The McIntire Department of Music is pleased to present the 2018-2019 University of Virginia Chamber Music Series. This annual series, which presents innovative performances by the University of Virginia's world-class faculty and celebrated guest artists, is comprised of six professional performances for the University and the central Virginia community. These intimate afternoon concerts are programmed to offer both new and traditional works that will delight audiences of all musical tastes. 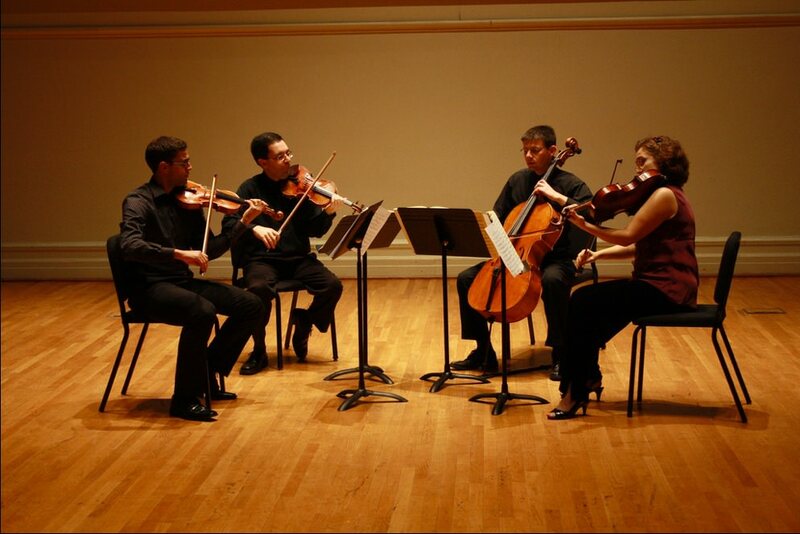 On Sunday, March 31, 2019 the Rivanna String Quartet will perform in Old Cabell Hall. The Rivanna String Quartet brings vibrant concerts to Central Virginia on the grounds of the historic University of Virginia. Quartet members are dedicated to promoting collaboration, quality performances, and education throughout the community. The Rivanna String Quartet looks to find the balance between the old and new, bringing a fresh look to the string quartet’s robust and varied repertoire through collaborations with living composers and guest artists. Rivanna is the resident quartet for the McIntire Department of Music at the University of Virginia, where the members serve as faculty and as principal musicians of the Charlottesville Symphony at the University of Virginia. Individually each musician maintains an active teaching and performing schedule within the community collaborating with such organizations such as the Kluge-Ruhe Aboriginal Art Collection, Ash Lawn Opera, Monticello, Charlottesville and Albemarle school systems, and the Richmond Symphony. Members of the quartet include Daniel Sender (violin), David Sariti ( violin), Ayn Balija (viola), Adam Carter (cello). Daniel Sender enjoys a diverse musical career and has appeared in concerts throughout the United States, Canada, Europe and China. A native of Philadelphia, Dr. Sender holds a Bachelor of Music degree in Performance and Education from Ithaca College and graduate degrees from the University of Maryland. He serves as concertmaster for the Charlottesville Symphony at the University of Virginia (The Mary Dean Scott Chair) and is on the faculty at the UVA McIntire Depatment of Music. Sender's teachers include Vilmos Szabadi, Gerald Fischbach, David Salness and the Guarneri Quartet. Violinist David Sariti maintains a career of uncommonly diverse musical accomplishments, with a repertoire spanning from the seventeenth century to the present day. He serves as Principal Second Violinist of the Charlottesville Symphony at the University of Virginia (The Robert D. Cross Memorial Chair) and is on the faculty at the UVA McIntire Department of Music. He completed his doctorate at the Hartt School (University of Hartford) in the Honors Chamber Music program, writing on "The Austro-German Violin Sonata, c. 1650". He also holds degrees from the University of Akron and Ithaca College. Studies were with Katie Lansdale, Pamela Gearhart, Pamela Frank and members of the Cleveland and Miami Quartets. Ayn Balija serves as Principal Violist of the Charlottesville Symphony at the University of Virginia (The Elizabeth W. Gatewood Chair). Ms. Balija earned her Bachelor of Music degree from the Oberlin Conservatory of Music and Master of Music degree from the Cleveland Institute of Music. Ayn is on the faculty at the UVA McIntire Department of Music, provides private lessons as a Boyd Tinsley Tutor in the Charlottesville Public Schools, performs outreach concerts, serves as President for the Virginia Viola Society and maintains a private viola studio. Jeffrey Irvine and Peter Slowik continue to be her principal instructors and mentors. Cellist Adam Carter is principal cellist for the Charlottesville Symphony at the University of Virginia (The Genevieve B. Horween & Marion H. Chase Chair) and is on the faculty of U.Va’s McIntire Department of Music. He received his Bachelors and Masters degrees with distinction from the Eastman School of Music, and received his doctoral degree from the University of Wisconsin-Madison. His principal teachers include Steven Doane, Rosemary Elliot, Robert Marsh and Uri Vardi.